The points listed below is information that should be included in the invitation card to the wedding. After that, you'll find suggestions for how to formulate text depending on who it is who invites - whether it's parents or couples. The location of the wedding reception, lunch or etc. Names of the persons responsible for the wedding, that the hosts. O.s.a. - The date you want guests later will announce that they will. Information to whom guests should respond if they can come or indisposed. Guest attire. This should always be included, even if the cover is "optional". For the invitation, you can attach a sheet with information about directions, ev. accommodation etc. 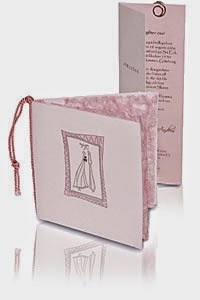 Also remember to formulate invitation depending on whether it is a formal or more informal wedding. What tone should the Wedding Invitation Wording be?